At Beverly Dental Center, we love helping little smiles grow up strong through warm, dedicated attention. Your child is always welcomed at our practice, and parents can count on Dr. Oh helping them feel right at home from the very first appointment. Dr. Oh has years of experience treating kids. Please contact us today in Carrollton, TX if you have any questions, or if you’re ready to plan a visit. What Can I Expect At My Child’s Dental Visit? 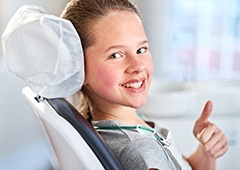 Our style of dentistry for your son or daughter’s appointment will be designed to match their current age, personality, and emotional maturity. For instance, very young children will receive gentle checkups for signs of developmental problems while older school-aged children and teenagers may be in need of more involved services like tooth-colored fillings, orthodontics, and metal-free restorative work. Our goal is to grow with your loved one over time, giving them the support and guidance they need to enjoy excellent oral health well into adulthood.